On the weeks we get fish, I like to cook it right away because I think meat holds better in the fridge than fish. 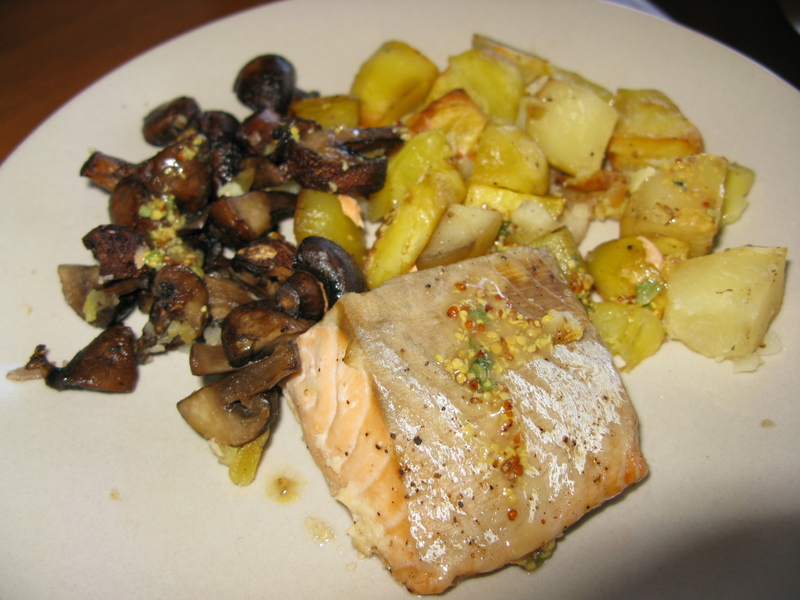 So the first recipe was baked salmon with potatoes (we had some left from last time) and mushrooms. It’s pretty simple, bake the seasoned potatoes and mushrooms for 20 min, then add the fish and bake for another 15min. We had more than the recipe asks for, and our steaks were pretty thick so I ended up leaving the fish in for another 5 or 10 min to make sure it was cooked all the way. But the best part was the sauce: red wine vinegar, whole grain mustard, honey and parsley. I’m not a big fan of salmon (I find it too fatty), but the sauce was quite tasteful so I actually ended up really enjoying this. Jeff does not like mushrooms at all, so they were all for me. I didn’t mind one bit because they were really tasty, none of that blandness you get from the white mushrooms from the grocery store. 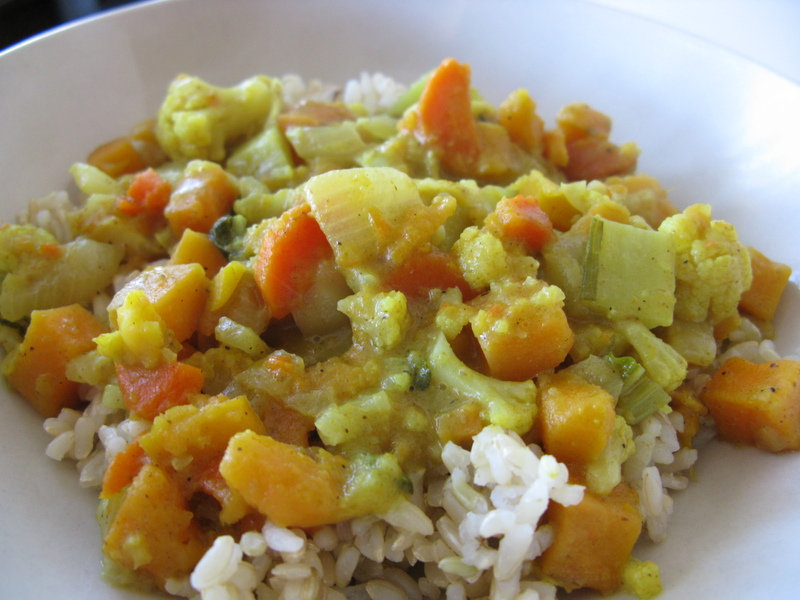 The next recipe I made was a vegetable curry. This was my first attempt at curry of any kind so I was a bit afraid of making it too spicy. I learned I can go much stronger than I did, but it was nice to have this dish for the days of stuffy noses and lazy taste buds… The curry includes sweet potatoes, cauliflower, onions and carrots. We had it with brown rice, but also sometimes on a bed of arugula. This makes for a great vegetarian dish. One of the problems I have with vegetarian dishes is that they end up being a bit bland, but not this one! And finally, as soon as I saw those cranberries, I decided to bake. 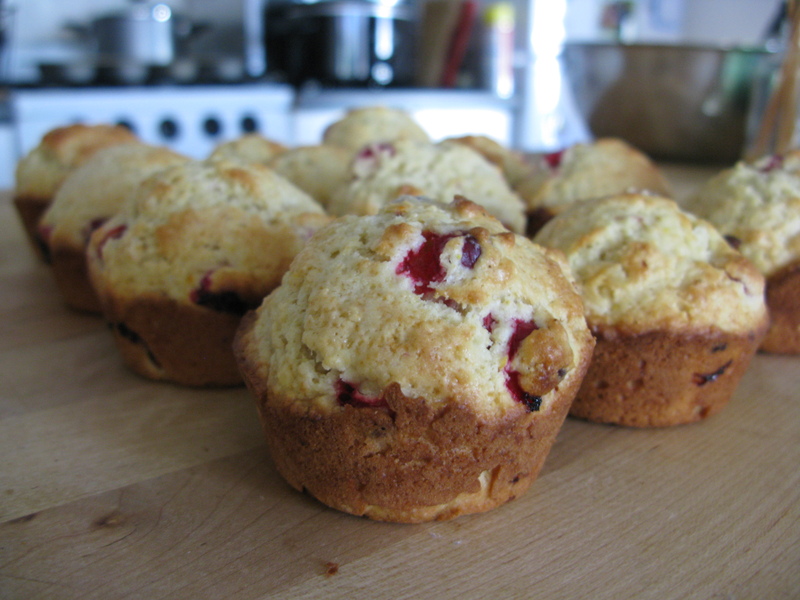 I made cranberry muffins. So easy, it’s silly that we don’t make this all the time… Mix 2 cups of flour, 2/3 cup of sugar, 2 tsp baking powder, 1/4 tsp salt and 1 cup of chopped cranberries. Separately, mix 2/3 cup of milk, 1/4 cup of melted butter, a bit of grated orange peel, 1/2 teaspoon of vanilla extract and 1 egg. Then mix the dry and wet ingredients, spray some cooking spray onto a muffin tray, place a spoonful onto each cup and bake at 400ºF (200ºC) for 15 to 20 min. Breakfast solved for the whole half the week. This entry was posted in Baking, Fish, vegetarian by Ines. Bookmark the permalink.